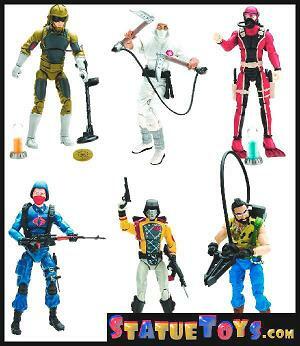 All over the net people are linking to this new picture of the upcoming wave 12 of GI Joe Modern Era figures (I've made a copy so you can avoid the pop-up ads all over imageshack - you can see the original here). Adam over at 16bit.com points out that they are all repaints which as far as I'm concerned definitely shows a bad trend in this line, and that Hasbro is taking advantage of the popularity to really keep milking the collectors. That said, I think the repaints look pretty cool, and I am one of many who will no doubt add them to the collection - I'm part of the problem! What I think is cool, and I haven't seen mentioned yet, is that two of the figures come with the final two elements for the MASS device! 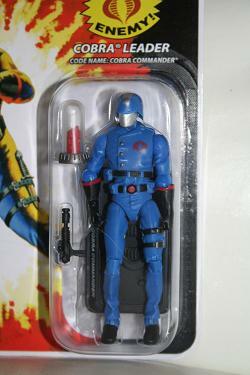 When the repackaged Cobra Commander came with the canister of pink crystals I was wondering what they intended. Then I got a hold of the DVD pack and realized that the canister exactly matched the empty ones on the base of the MASS Device, and was thrilled to realize that they would probably pack in the remaining two elements in future waves. Well, here we have them, and I think it's a fine way to make the repaints just a little bit more awesome.